A professional standard system, Beolab 5000 comprised the eponymous Beolab 5000 amplifier, Beomaster 5000 stereo tuner, Beovox 5000 floor standing loudspeakers and Beovox 2500 ‘cube’ tweeters. To this could be added other sources such as the Beocord 2000 open reel tape recorder, another unit with serious professional aspirations and the very rare Beogram 3000. Text copyright © Beocentral. Unauthorised reproduction prohibited. 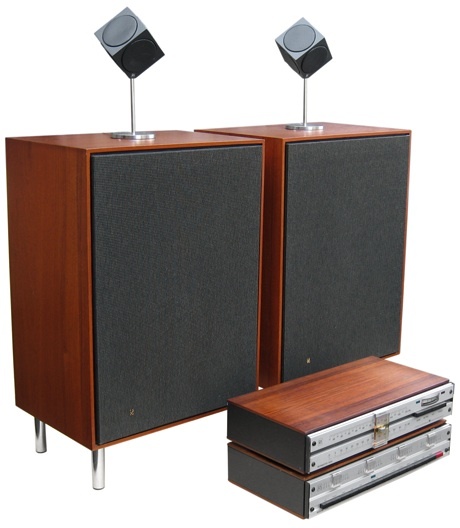 This last unit was in fact collaboration between B&O and the eminent turntable manufacturer Thorens and was a rebadged Thorens TD124 with a B&O tone arm and cartridge set in rosewood B&O plinth. This was a true audiophile turntable and in common with many of that breed was quite complicated to set up and sensitive to its environment. It was none the less a superb piece of engineering and quite in keeping with the rest of the Beolab 5000 system. Text copyright © Beocentral. Unauthorised reproduction prohibited. This system remains as the best made B&O system to date and the performance was such that even today it remains able to outshine many of its successors. B&O never again attempted a foray into this market concentrating on more user-friendly designs and even the Beolab 8000, which was superior in sound quality and power, was not built to the same exacting standards. Text copyright © Beocentral. Unauthorised reproduction prohibited. 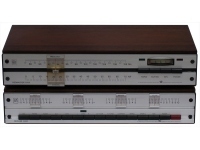 B&O used the experience gained in this system to launch a range of cheaper but still sophisticated products onto the market led by the Beomaster 3000 which propelled the company to great successes. Text copyright © Beocentral. Unauthorised reproduction prohibited. The system won the IF award at the 1967 Hanover spring fair. It was designed by Jacob Jensen as his first project for B&O. Text copyright © Beocentral. Unauthorised reproduction prohibited.